Custom knee braces off-load stress placed on the joint to diminish pain and stiffness. Bracing allows the patient to control the position of the joint, be it to restrict undesired or potentially harmful motion, or allow desired motion. Custom knee braces are specifically designed and handmade for each individual patient, allowing for a perfect fit and a significant reduction in symptoms. Braces can either be ready to wear off-the-shelf or both our off-the-shelf and custom made knee braces are manufactured using the highest quality processes and materials. Healthmax Physiotherapy has a team of skilled therapists specifically trained in the assessment and fitting process for custom knee braces. You can be measured and fit for a custom knee brace in any of our clinics across Toronto and the GTA. When used to unload bone-on-bone pressure, custom knee braces gently apply pressure to the unaffected side of the knee, thereby relieving compression in the affected side. The force that is present in the degenerative part of the knee is greatly reduced, providing long-term pain relief and often eliminating the need for surgery or medication. When used to treat ligament issues, custom knee braces stabilize and protect, in a comfortable, lightweight and easy-to-adjust construction. 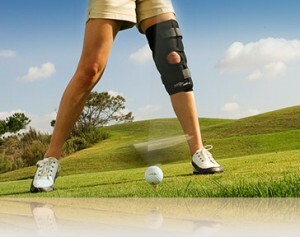 Custom knee braces allow for continued physical activity by relieving unbearable pain and discomfort. Particularly The benefits are even greater if your knee brace is customized for a perfectly fit around your joint and suited to your individual body type and activity levels., the benefits are even greater. Wearing a custom knee brace, when combined with other forms of treatment, can be highly effective. At Healthmax Physiotherapy clinics, our well-rounded team of physical therapy experts works together to offer a comprehensive, integrated treatment plan that optimizes results in the interim and sustains prevention in the long term. Contact us today to book an appointment for a custom knee brace fitting at one of our clinics in Toronto.